Welcome to Vol. 4 Iss. 3 of the VOX-Pol Newsletter. If you have colleagues or friends who may be interested in the content of our newsletter, or any events or research carried out by VOX-Pol, please forward this to them and encourage them to subscribe via our website. Follow us on Twitter @VOX_Pol for live updates and releases. VOX-Pol’s second Training Academy, a week-long event dedicated to exploring various topics at the nexus of violent extremism, terrorism, and the Internet, will be held from 18 – 22 September 2017 in The Hague, The Netherlands. Applicants should be professionally-tasked in the area of violent online political extremism, including law enforcement officials, policymakers, and social media company representatives. Details regarding the previous VOX-Pol Training Academy are available HERE. The closing date for receipt of applications is 28 August 2017, or until places are filled. King’s College London will host this two-day VOX-Pol academic workshop on 16 – 17 October 2017. Social scientists have approached online jihadism from distinctive perspectives across Europe, the US, and the Middle East, depending on their cultural and political contexts. Beyond the English-language literature, researchers collected and explored different empirical evidence to understand and counter this phenomenon in their country-specific environments. Despite offering a highly original insight into the field of violent political extremism, these alternative sources of expertise are hardly relayed in the Anglo-Saxon world. This workshop will contribute to bridging this gap by bringing together two panels of international experts from Europe and the Middle East to explore some of the findings that have been disseminated in languages other than English. For further information on the upcoming workshop, see HERE. VOX-Pol is hosting a start-up workshop on 7 September 2017 in Dublin’s DCU Alpha, in collaboration with the Tech Against Terrorism initiative, to reach out to the tech start-up community in Ireland, to discuss counter-terrorism preparedness. The event is designed to educate start-ups on the nature of the threat, and the ways in which their platforms might be susceptible to exploitation, to learn what particular vulnerabilities firms might have identified, and to ascertain the best means for the Tech Against Terrorism team to provide support. For further details, see HERE. VOX-Pol will host a workshop titled ‘Countering Violent Extremism Online and the Impact on Civil Liberties’ at Harvard University’s Berkman Klein Centre for Internet and Societyon 23 – 24 October 2017. The purpose of the workshop is to explore the challenges and opportunities facing actors engaged in countering violent extremism online, particularly the impact of content regulation on civil liberties. The workshop is connected with a VOX-Pol study being conducted by Central European University’s Center for Media, Data and Society on the same topic. Further details will be available on the VOX-Pol website shortly, HERE. For real-time updates, please follow us on Twitter @VOX_Pol. The most recent workshop in the VOX-Pol Workshop Series was convened on 22 May 2017 at University College London. The aim of the workshop was to provide participants with an insight into the main debates, issues, achievements, gaps and methodological challenges in research on violent and non-violent online political extremism and online radicalisation. Presentations included those on anonymity and the fostering of radical action, Irish Republicanism online, the English Defence League’s management of stigma on Facebook, ‘Foreign Fighters’ and new media ecologies, fighting ISIS on Facebook, 4chan’s Politically Incorrect forum, and #gamergate. The workshop attracted 34 participants, including academics and representatives from NGOs and government agencies, from five countries. 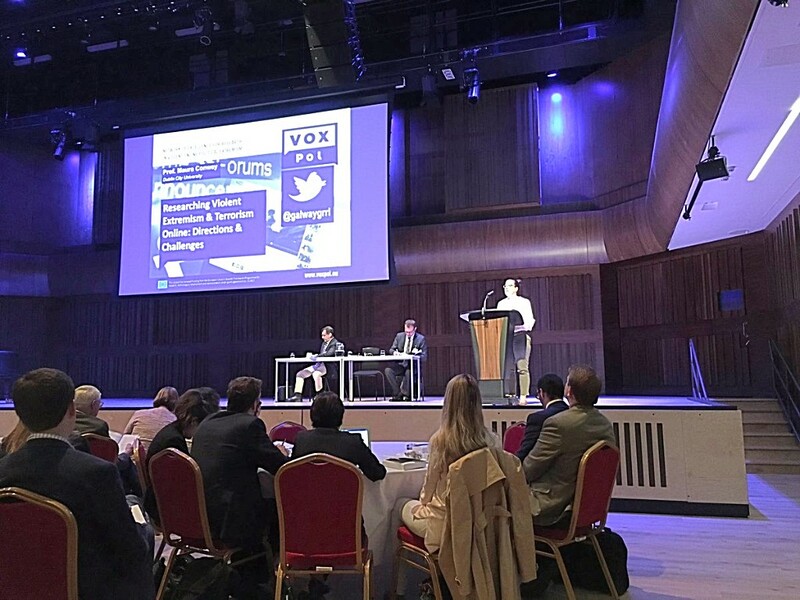 VOX-Pol was a co-sponsor of the Terrorism and Social Media Conference (TASM) hosted by Swansea University’s Cyberterrorism Project on 27 – 28 June 2017. 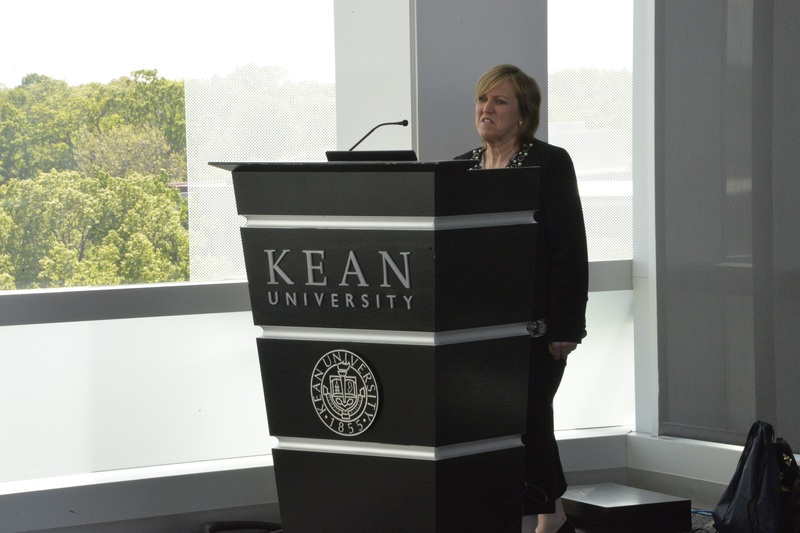 VOX-Pol Coordinator Prof. Maura Conway delivered a keynote speech entitled ‘Researching Violent Extremism and Terrorism Online: Challenges and Directions.’ During her speech, Prof. Conway showcased VOX-Pol’s Online Library. A special issue of the scholarly journal Studies in Conflict & Terrorism will emerge from the conference. Prof. Maura Conway will be a co-editor of the special issue, along with Swansea University’s Prof. Stuart Macdonald. The TASM conference was followed by a one-day Terrorism and Social Media Sandpit on 29 June in which a range of new research ideas were generated, two of which were subsequently chosen for funding by VOX-Pol and The Cyberterrorism Project. One of these projects will explore computer gaming and the other, ethical issues around violent online extremism research. 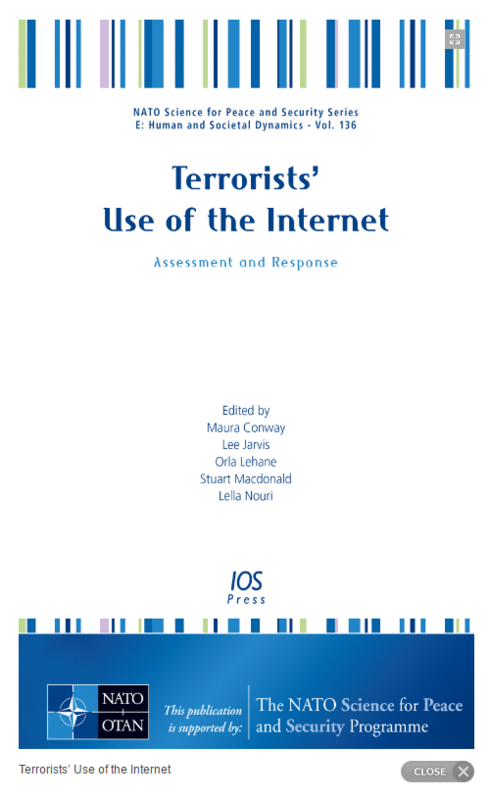 Our new edited volume ‘Terrorists’ Use of the Internet: Assessment and Response’ was published on 10 June. The book presents revised versions of a selection of papers delivered at the joint VOX-Pol and Cyberterrorism Project-organised NATO Advanced Research Workshop on ‘Terrorists’ Use of the Internet’ held in DCU on June 2016. A full report of the workshop can be found HERE. The book’s 25 chapters are grouped into five sections on cyber terrorism and critical infrastructure protection, cyber-enabled terrorist financing, jihadi online propaganda, online counterterrorism, and innovative approaches and responses. The book was released through IOS Press and is available HERE. A pre-publication version of Prof. Maura Conway, Jodie Parker, and Sean Looney’s chapter on ‘Online Jihadi Instructional Content: The Role of Magazines’ is free-to-accessHERE. On May 15, VOX-Pol Programme Manager Lisa McInerney participated in theNew Jersey Office of Homeland Security and Preparedness’ (NJOHSP) Second Annual Domestic Terrorism Conference. Lisa provided an overview of VOX-Pol, along with a presentation entitled ‘Violent Online Political Extremism: State of Play 2016/17, and Future Trends.’ A podcast was also produced in which NJOHSP’s Analysis Bureau Chief Dean Baratta sat down with Lisa to explore current and prior efforts on combating violent (online) political extremism and radicalization. The podcast is availableHERE. Also on 15 May, VOX-Pol’s Coordinator, DCU’s Prof. Maura Conway, gave a keynote address at Dublin’s Institute of International and European Affairs (IIEA), in which she detailed the development of IS’s online strategy from 2014 to the present. She also examined the contemporary disruption by social media companies of IS’s online activity and its effectiveness. Video of the keynote can be found HERE. The presentation slides are available in PDF format HERE. The audio podcast of the keynote is available HERE. On 9 June, VOX-Pol Researcher, Sean Looney, with Swansea University’s Amy-Louise Watkin, presented an analysis of child images in jihadi magazines at the Society for Terrorism Research Post-Graduate Conference in Belfast. 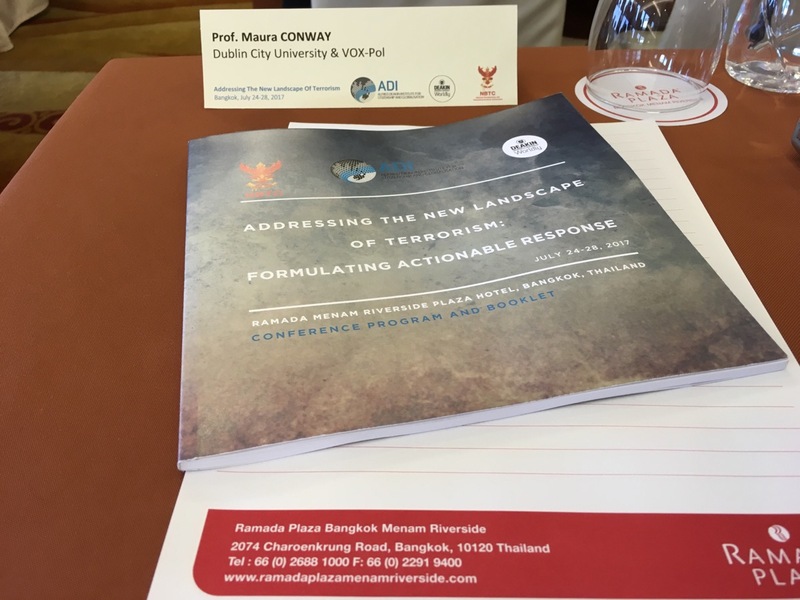 On 24 – 27 July, VOX-Pol Coordinator, Prof. Maura Conway, participated in Deakin University’s conference on ‘Addressing the New Landscape of Terrorism: Actionable Responses,’ in Bangkok. Prof. Conway chaired a panel on ‘Understanding Radicalisation’ on the first day of the conference. She presented research, co-authored with colleagues, on ‘Disrupting Daesh: Measuring Takedown of Online Terrorist Material and Its Impacts’ on a panel concerned with ‘ISIS and Social Media’ on Day 2 of the conference. The four-day conference was followed-up with a one-day workshop focused on academics and practitioners working together to develop initiatives in the CVE realm. Prof. Conway co-chaired a session session on ‘Media and Terrorism’ together with Mohammed Kozbar of Finsbury Park Mosque, London. Former VOX-Pol Research Fellow, Dr. Matti Pohjonen co-authored a paper with Dr. Sahana Udupa, entitled ‘Extreme Speech Online: An Anthropological Critique of Hate Speech Debates,’ which was published in the International Journal of Communication. Matti Pohjonen’s work was partially sponsored by VOX-Pol. The full paper is free-to-access HERE. VOX-Pol Coordinator, Maura Conway’s article titled ‘As ISIS Territory Shrinks It Will Rely More on Internet’ was published by the Irish Times on 8 June 2017. VOX-Pol Research Assistant, Sean Looney’s co-authored blog post titled, ‘Children are Being Used as Easy Weapons of Propaganda by Terrorist Organisations’ was published by The Conversation on 27 June 2017. VOX-Pol Researcher Exchange Programme alumna, Elizabeth Pearson’s article titled ‘Why ISIS Female Suicide Bombers Mean the End of the Caliphate Dream’ was published by Newsweek on 18 July 2017.